The Multnomah was a stern-wheel steam boat that was originally built for the Willamette Steamboat Company in 1885 in Portland Oregon. It was 143 feet in length, with a beam of 28 feet, and just over 5 feet depth of hold. During her short Oregon career she was one of the fastest and most economical steamers of her time. At the start of the 1890’s she was sold to parties up north in Washington and took part in the Seattle-Tacoma-Olympia trade. The S. Willey Steam Navigation Company was running the Multnomah on that route up until 1903. The sternwheeler was then bought out by the McDonald Steamship Company by Captain H.H. McDonald, who didn’t own her for long. McDonald, thinking by owning the Multnomah, Capital City, Elwood, and the Skagit Queen, would have a clear monopoly in the steamboat business between Olympia and Seattle, wasn’t happy at all when the Greyhound moved on in to part of his territory. He decided to try and bluff out the Greyhounds owners by threatening a rate war. He stated he’d go as low as 10 cents per person for the Olympia-Tacoma trip. The Greyhound called his bluff. 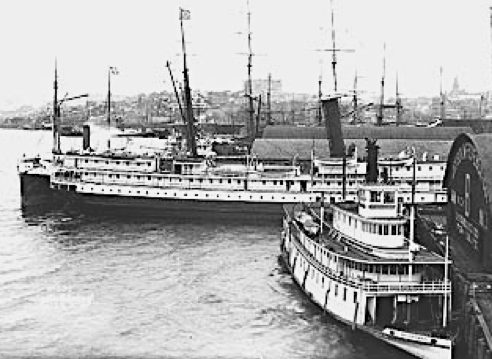 By the end of 1904 McDonald Steamship Company sold the Multnomah to the Olympia-Tacoma Navigation Company. The same company that owned the Greyhound. The Multnomah and the Greyhound teamed up for the rest of their days carrying governors, legislators, national figures, ordinary citizens, and various cargo including large quantities of beer barrels from Olympia to the southern ports. The Multnomah had a couple known adjustments in her years in service. In 1907 she was converted from slab wood burners to oil burners. Around that same year, as the Multnomah was making her way through the narrows against the tide, she snapped her middle rudder and was brought in to Tacoma for repairs. After 1911 Olympia said goodbye to the sternwheeler and she assumed a new role in Elliot Bay. A rancher’s possessions, including chickens, horses, and cattle, were on board the Multnomah during her last voyage. She was entering Elliot Bay taking a straight course from Duwamish Head to Galbraith Dock (Pier 57) in dense fog, when the steamer Iroquois rammed her steel hull into the Multnomah’s wooden side. Dive reports after the accident state that she sits upright and that the freight deck was littered with the still tied down skeletons of the drowned farm animals. She lies in approximately 270 feet salt water.